Mulayam Singh, who was sidelined by his son before the Uttar Pradesh election earlier this year and left to a mentorship role in the party he founded 25 years ago, was expected to announce a new outfit. 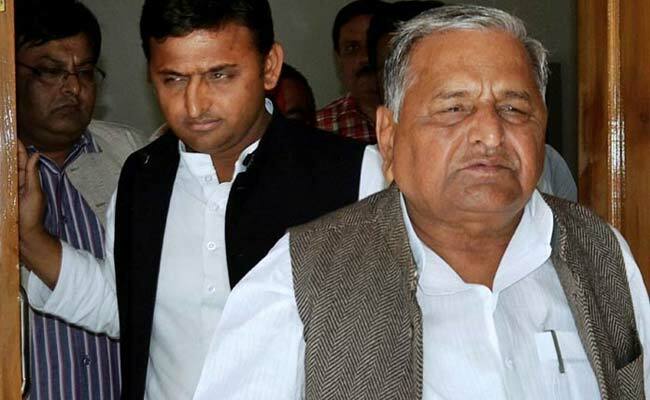 Mulayam Singh Yadav made it clear that he was not ready to mend bridges with his son Akhilesh. Lucknow: Mulayam Singh Yadav did not announce a new party today, as was widely expected and declared instead that it was his estranged son Akhilesh Yadav who had quit the Samajwadi Party, really. "He is my son and so has my blessings but I do not agree with his decisions," said the Samajwadi Party patron. Perhaps in a deeper cut, Mulayam Singh used a comment by Prime Minister Narendra Modi - without taking names - to taunt his son: "A big leader of this country said one who can't honour promises to his father, how can he be there for the people?" After his father's umpteenth public slight, Akhilesh Yadav tweeted: "Netaji zindabad, Samajwadi Party zindabad!" Mulayam Singh, who was sidelined by his son before the Uttar Pradesh election earlier this year and left to a mentorship role in the party he founded 25 years ago, was expected to announce a new outfit - the Akhil Bharatiya Samajwadi party. He and his brother Shivpal Yadav had pointedly stayed away from a big Samajwadi meeting saying they were not invited. The new party was to be announced with the Lok Dal, whose president Sunil Singh was quoted by the Press Trust of India as saying yesterday: "Mulayam will hold a press conference at the Lohia Trust office to announce a new party with Lok Dal." But today, Mulayam Singh simply urged "people of a Samajwadi mindset to join us" and told reporters: "I am not forming any new party as of now." Sources say no announcement signals attempts at a patch-up between father and son. Asked to comment on Akhilesh Yadav's claim that he had his father's blessings, the Samajwadi Party patron said: "If he has said that, it must be true." The tone quickly turned sharp and resentful as the veteran recalled Akhilesh's shake-up before the UP polls that saw the Samajwadi Party lose power and the BJP reveling in an outstanding victory. "He told me that he would make me president within three months after the election. He who can't honour his word, who betrays his father..." Mulayam Singh said. Making it clear that he was not ready to mend bridges with his son, he added: "No one can say for sure how long differences will remain between father and son."